A video has emerged on Facebook yesterday of police assaulting a number of Aboriginal people in the small Queensland town of Murgon . The elderly officer appears to be well past his days of being fit for active service. Perhaps he thinks he is still living under the Aboriginal protection act of days gone by. The video has now been viewed over 320,000 times in just over 24 hours. According to witnesses the officer was later seen sobbing in his vehicle and was heard saying that he had just returned from leave. Perhaps it’s time for the police to let him go. There was no reason for the policeman to be using heavy handed tactics in this situation. There would have been no further problems if the police were the ones to just move on. 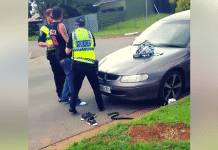 After violently grabbing the woman in the video, the officer crash tackled a young Aboriginal girl who had picked up a key that the elderly officer had dropped. She was holding it out to give it back to him. Unbelievably, people on social media are trying to defend the officers actions. Why does he feel he can just violently lash out when he loses his patience? These are not responsible actions by someone of this position. Hopefully the video will prompt some investigation into the future placement of this officer within Queensland police. Update: The incident has been referred to the ethical standards command. If you didn’t see it already, please check out our story on Western Australian police who are using attack dogs on Aboriginal children. Mainstream media are still failing to investigate and report on this issue. Previous articleRemember when Jessica Mauboy was a 14 y.o emerging country music star?